As information filters in from outlying communities, we are learning of the scale of the devastation caused by Cyclone Pam. 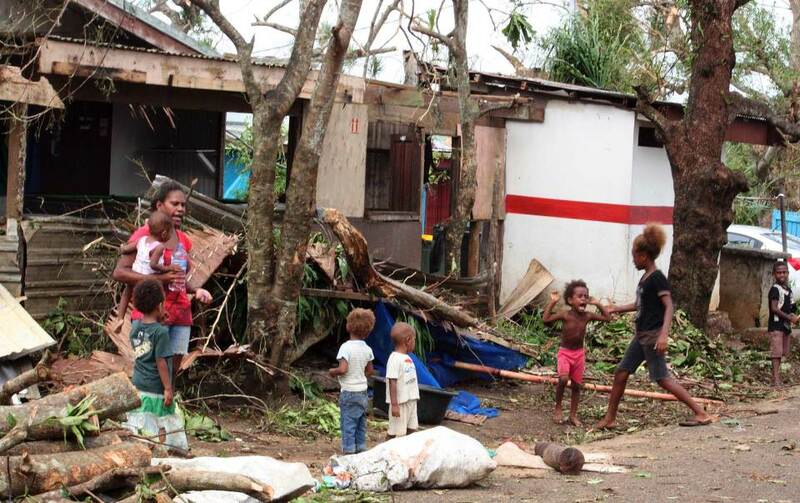 Vanuatu’s President has stated that most of the country is now homeless and thousands of families are currently crowded into evacuation centres. There is huge need to support the tens of thousands of people affected by this disaster and agencies have begun providing medical aid, clean water and food. There is also a desperate requirement for temporary shelter, before repairs and rebuilding of homes can commence. Shelter needs are predicted to be high as early assessment indicates damage to housing is severe. “We have launched an appeal to raise much needed funds for disaster response operations,” said Martin Thomas, CEO. Habitat for Humanity has sent staff to Vanuatu to assess the situation and coordinate with government agencies and partners on the disaster response operation. Habitat for Humanity’s immediate response efforts will include emergency shelter assistance. Based on funding availability, the longer-term response will follow Habitat’s model of assisting affected communities with housing solutions, ranging from emergency shelter interventions to permanent home reconstruction. Habitat for Humanity has worldwide experience responding to disasters, most recently following Typhoon Haiyan in the Philippines. Please support our work with a tax-deductible donation today and help us provide basic, safe shelter to families who have lost their homes and communities.